Larry Force will be our July 2019 guest speaker and will give a program entitled New Miniature and Standard Daffodils. Larry has had a long time interest in horticulture that covers gardening annuals, perennials, hostas, lilies, native trees and wildflowers. He grows a number of host and nectar plants for native butterflies, nectar producing plants, as well as providing feeders for the hummingbirds in the summer. Larry became more interested in daffodils after attending a program at the Memphis Horticulture Society given by Brent Heath. 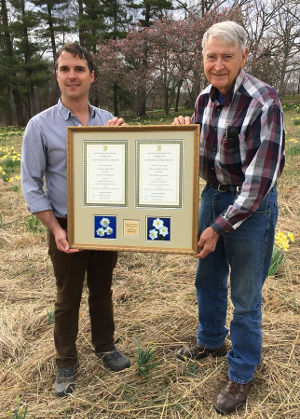 He joined the American Daffodil Society soon after and began to grow more daffodils. His interest in miniature daffodils grew through an acquaintance with Martha Anderson, a long time grower and exhibitor of miniatures. Larry began hybridizing in 2000 because few new and different miniatures were available from commercial sources. Larry also does intermediate, standard, and poet daffodil hybridizing. In his presentation Larry will expand on his talk given during the 2016 World Daffodil Convention. His presentation will focus on the miniature and standard daffodils that have evolved from his hybridizing efforts, as well as a few photos of his seedlings and daffodil bed preparation. Larry is never boring and has learned through trial and error the things that all of us as daffodil growers should learn before making them ourselves. Members of the Greater St Louis Daffodil Society are thrilled that Larry has found time in his schedule to help us learn from his experiences while hybridizing and growing daffodils.